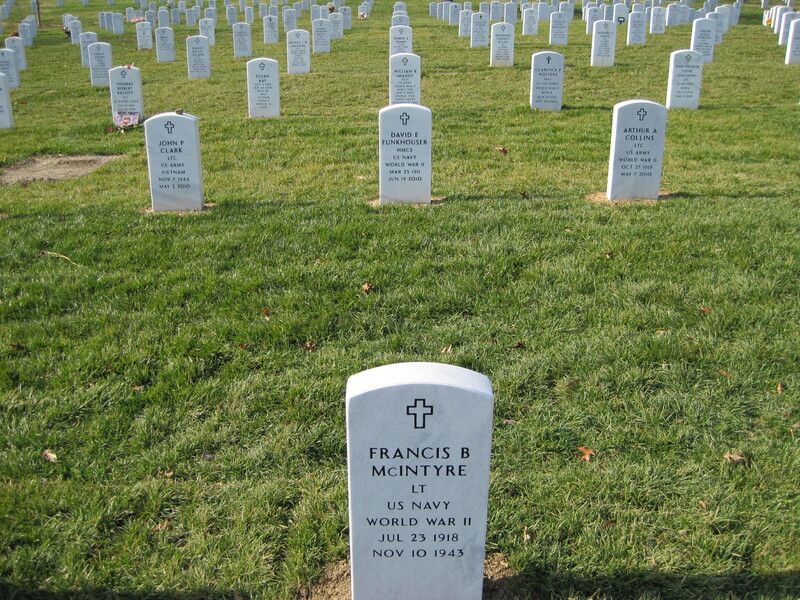 Navy Lieutenant Francis B. McIntyre of Mitchell, South Dakota, will be buried on September 29, 2010, and Aviation Radioman Second Class William L. Russell of Cherokee, Oklahoma, will be buried on October 1, 2010. Both men will be buried at Arlington National Cemetery. On November 10, 1943, the two men took off on a bombing and strafing mission in their SBD-5 Dauntless dive bomber from Munda Field, New Georgia, in the Solomon Islands. Witnesses last saw the aircraft flying at low altitude through a large explosion on an enemy airfield on Buka Island, Papua New Guinea. None reported seeing the crash of the aircraft itself. In 2007, a Papuan national found a World War II crash site near the Buka airport, which was reported to U.S. officials. In May 2008, specialists from the Joint POW/MIA Accounting Command (JPAC), working with the country’s national museum, investigated the crash site but were unable to excavate it because of inclement weather. Local officials turned over human remains, McIntyre’s identification tag and other military-related items which had been recovered earlier. After examining the remains in 2008 and 2009, JPAC determined that no excavation would be required since the two sets of remains were nearly complete. Among other forensic identification tools and circumstantial evidence, scientists from JPAC used dental comparisons for both men and the Armed Forces DNA Identification Laboratory used mitochondrial DNA which matched a sample from Russell’s relatives and DNA extracted from a hat belonging to McIntyre. 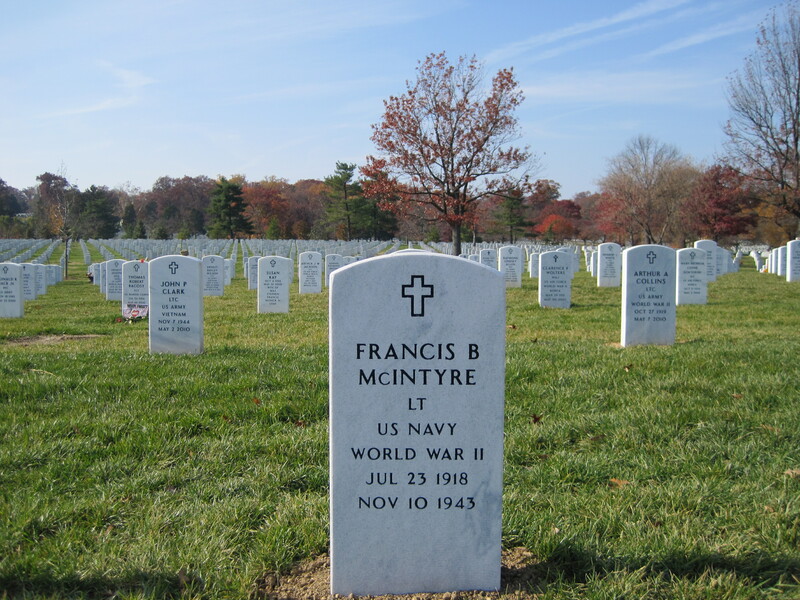 Lost for 67 years, Navy Lt. Francis B. McIntyre is coming home. 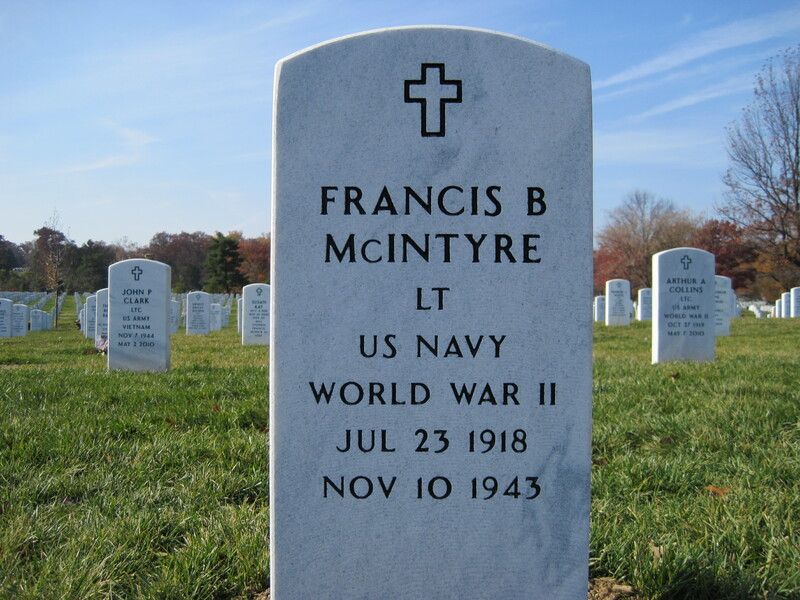 McIntyre, a Mitchell native who was killed in a World War II plane crash, will be buried in Arlington National Cemetery Friday, according to the Defense POW/Missing Personnel Office (DPMO). The DPMO recently announced that the remains of two servicemen, missing in action since 1943, have been identified and are being returned to their families for burial with full military honors. McIntyre and Aviation Radioman Second Class William L. Russell of Cherokee, Oklahoma, will be buried at the historic national cemetery. On November 10, 1943, the two men took off on a bombing and strafing mission in their SBD-5 Dauntless dive bomber from Munda Field, New Georgia, in the Solomon Islands. Witnesses last saw the aircraft flying at low altitude through a large explosion on an enemy airfield on Buka Island, Papua New Guinea. None reported seeing the crash of the aircraft itself but McIntyre and Russell were never seen again — until their bodies were found more than six decades later. McIntyre apparently was born in Mitchell and Census records showed he lived here in 1920 and 1930. His mother died in 1924 and his father died in 1934. According to The Daily News of Longview, Wash., McIntyre lived in the area before joining the Navy and still has family there. “In February 2008, a Papua New Guinea newspaper reported that a local man found the remains of a U.S. Navy plane near a garbage dump on Buka Island. The island’s residents recovered human bones and a dog tag with Francis McIntyre’s name on it,” according to the article. Francis “Tully” McIntyre of Seattle, who was named for his uncle, said the plane was submerged in a swamp for more than 60 years and appears to have emerged only after warm weather dried the area. According to the DPMO, the American Graves Registration Service searched numerous South Pacific Islands in 1949 in an effort to gather data about aircraft crashes or missing Americans. The team was unable to find any useful information, and failed to recover any American remains in the area. A board of review declared both men unrecoverable. In 2007, a Papuan national found a World War II crash site near the Buka airport, which was reported to U.S. officials. In May 2008, specialists from the Joint POW/MIA Accounting Command (JPAC), working with the country’s national museum, investigated the crash site but were unable to excavate it because of inclement weather. Local officials turned over human remains, McIntyre’s identification tag and other military-related items which had been recovered earlier. After examining the remains in 2008 and 2009, JPAC determined that no excavation would be required since the two sets of remains were nearly complete. Among other forensic identification tools and circumstantial evidence, scientists from JPAC used dental comparisons for both men and the Armed Forces DNA Identification Laboratory used mitochondrial DNA, which matched a sample from Russell’s relatives, and DNA extracted from a hat belonging to McIntyre. Among other forensic identification tools and circumstantial evidence, scientists from JPAC used dental comparisons for both men. The airmen’s return is the latest in a long list of American heroes who were lost but not forgotten.